WORKSHOP8’s Las Cruces CROSS\TOWN station receives 2nd place. Our tireless team provided master planning, site planning, architecture and graphic services for the developer, Thomas Development Group in association with Tierra del Sol Housing Corporation. Last year our design for Peachtree Canyon took third place. The plans are intelligent, responsive to site, and quite functional. Landscaping features are appropriate and plentiful. Tree plantings are used to create a natural buffer between the housing, the street, and parking areas. 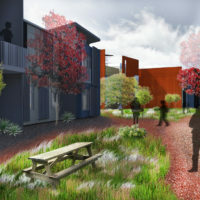 The layout of the buildings on the site creates a nice balance between an orientation to the street and private courtyard spaces. The site plan makes good use of street parking and disburses parking throughout the site. The variety of building elevations and selection of materials are architecturally interesting while the integration of new with existing buildings reflects sensitivity to the urban nature of the site. The layout of the units offers functionality and comfort with the use of natural lighting and ventilation.